Yuliy Borisovich Briner (July 11, 1920 – October 10, 1985) was instantly recognizable as one of the most distinctive looking and sounding film stars of the 1950s and 1960s. His shaved head was a trademark. 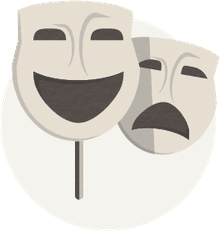 He gained fame delivering the definitive performance of the lead role in the hit musical "The King and I" both on the Broadway stage and on screen. Early in his career, Yul Brynner told the press a number of made-up and exaggerated stories about his childhood. He claimed to be born on the Russian island Sakhalin. In reality, he was born in the city of Vladivostok, on the Russian mainland. Today a statue of Brynner stands outside his birthplace. His father, a mining engineer, fell in love with an actress at the Moscow Art Theatre in 1923 and abandoned his family. Yul Brynner's mother took him and his sister to Harbin, China. In 1932, when war between China and Japan appeared inevitable, his mother moved to Paris, France with her children. Teenage Yul Brynner played his guitar in Russian nightclubs in Paris, and he trained and performed as a trapeze acrobat. When a back injury ended his trapeze career, Brynner turned to acting as a profession. He emigrated to the U.S. with his mother in 1940 and settled in New York City. During World War II, Yul Brynner worked as a French-speaking radio announcer for the U.S. Office of War Information, which broadcast programs to occupied France. He also studied acting with Russian actor Michael Chekhov, a nephew of the legendary playwright Anton Chekhov. Yul Brynner made his first appearance on Broadway in 1941 with a small part in a production of William Shakespeare's "Twelfth Night." In 1946, Yul Brynner befriended Broadway star Mary Martin when he appeared with her in Lute Song. She encouraged him to audition for a part in a new Rodgers and Hammerstein musical. He found some success directing for early television, and he was reluctant to try again at stage acting. However, when he read the script, he became fascinated by the role of the King of Siam. Landing the lead role in "The King and I" became the definitive moment in Yul Brynner's career. By the time of his death, Yul Brynner had performed in "The King and I" 4,625 times on stage. He appeared in the original 1951 Broadway production and won a Tony Award. In 1956, he played the part in the film version and earned an Academy Award. Brynner returned to Broadway in "The King and I" in 1977 and again in 1985 when he won another Tony Award. Yul Brynner first shaved his head for the lead role in "The King and I," a style he maintained for the rest of his life. His bald appearance and distinctive voice were unique trademarks throughout his career. Also in 1956, Brynner appeared in "Anastasia" co-starring with Ingrid Bergman in her Academy Award-winning role and in the box office smash "The Ten Commandments." He was suddenly one of the biggest stars in Hollywood. Yul Brynner was named as one of the top 10 money-making box-office stars of both 1957 and 1958. Yul Brynner appeared in additional hit films like "The Brothers Karamazov" and "Solomon and Sheba" in the latter part of the 1950s. Then, in 1960, he played a co-starring part in the Western "The Magnificent Seven." It was a critical success and later earned an almost cult-like appreciation. Brynner focused on action films through the 1960s and into the 1970s. He didn't have another major box office hit until appearing as a robot in the futuristic thriller "Westworld" in 1973. Yul Brynner's final movie was the Italian action film "Death Rage" in 1976. 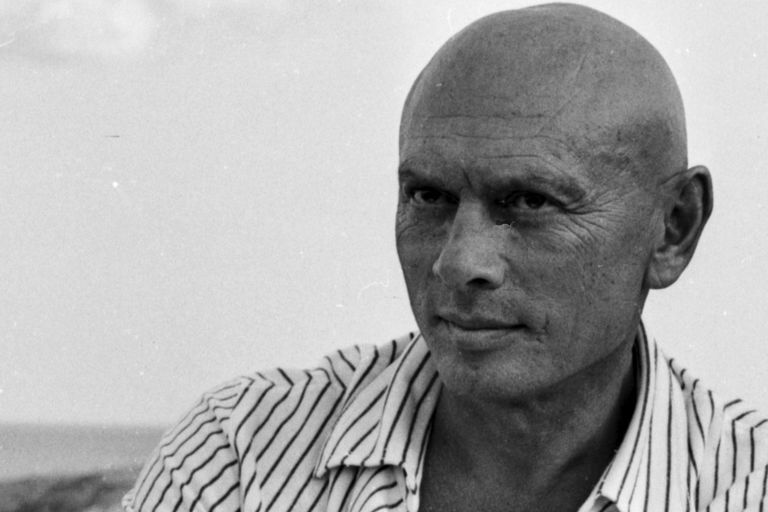 Yul Brynner was married four times. His first three marriages ended in divorce. He was married to actress Virginia Gilmore from 1944 through 1960. She gave birth to one child, Rock Yul Brynner, in 1946. He was named after boxer Rocky Graziano. Rock wrote a biography of his father titled "Yul: The Man Who Would Be King." Late in Yul Brynner's marriage to Virginia Gilmore, he had an affair with actress Marlene Dietrich. In 1959, he fathered a daughter, Lark Brynner, with 20-year-old Frankie Tilden. Brynner married for the second time in 1960 to the Chilean model Doris Kleiner. Their daughter, Victoria Brynner, was born in 1962. The marriage ended in divorce in 1967. French socialite Jacqueline Thion de la Chaume was married to Yul Brynner from 1971 through 1981. Together they adopted two Vietnamese children, Mia and Melody. In 1983, at age 62, Yul Brynner married his fourth wife, 24-year-old ballerina Kathy Lee. She survived him. Yul Brynner was a heavy smoker from age 12 through 51. In 1983, after celebrating his 4,000th stage performance in "The King and I," he was diagnosed with inoperable lung cancer. After taking time off for radiation therapy and recovery of his singing voice, Brynner returned to the stage. His last performance of the show took place in June 1985. Before dying of lung cancer in October, Yul Brynner made an anti-smoking public service advertisement for the American Cancer Society. He was buried in France. Yul Brynner is one of the few film lead actors born in Asia to develop an enduring career as a star. He is also best known for portraying an Asian role. He also cultivated an enigmatic image that was both sophisticated and worldly. He was fluent in a number of languages and was a skilled guitar player in addition to his acting talent and physical energy. His photography was of a high enough quality that it was sometimes used by film studios for official production stills. Tony Award for Best Featured Actor in a Musical (1952): Appearing as the King of Siam in "The King and I." Academy Award for Best Actor in a Motion Picture (1956): Appearing as the King of Siam in "The King and I." Brynner, Rock. Yul: The Man Who Would Be King. Berkeley Books, 1991. Capua, Michelangelo. Yul Brynner: A Biography. McFarland, 2006.